In this book, aimed at both parents and professionals, the authors discuss the non-evidence-based interventions that proliferate in the fields of children's speech, language, literacy, fluency, voice, communication, attention, cognition, working memory, behaviour and social connectedness. They explore the science - or lack thereof - behind the interventions and suggest evidence-based alternatives that enjoy stronger scientific support. Suggestions for interventions with proper scientific support, suitable for the children in question. ...This is a comprehensive guide to the evidence base for interventions for children with developmental disorders. It provides a clear summary of our clinical breadth of expertise. The chapters cover specific clinical areas and provide information SLTs do not always have the time to research in depth. Some interventions get more coverage than others, which reflects current research. It is also interspersed with diagrams and illustrations that help to make the content more accessible. The book names and shames the interventions with no scientific evidence, but acknowledges the ones that 'show promise' but need to develop the level of evidence. The style of the book will be accessible to most parents as it presents the parent perspective eloquently; and it is helpful for SLTs to reflect on why some approaches may be attractive to parents. it advocates 'Information Literacy', with advice to help parents navigate the minefields of the internet and the marketplace. 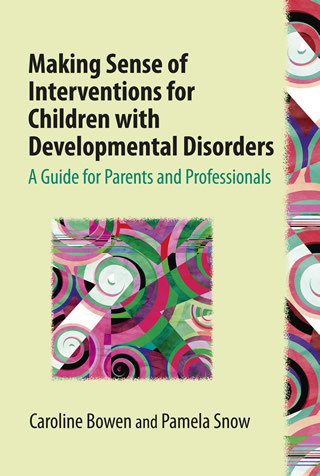 This book will undoubtedly help SLTs and parents understand the evidence levels of the interventions that are currently available for a range of developmental disorders. there are regular updates on this title on Twitter: @txchoices. Please ensure you select the correct postage region from the drop-down below. Unfortunately we are unable to ship your order unless the correct region is selected. A full list of the Bowen & Snow 2017 references is available here and you can also view Pamela Snow's blog.